Packing a load limit of 4,252kg and providing excellent resistance to corrosion, our 9mm diameter iteration of the 18×7 stainless steel rope range will slot neatly into a number of different applications. Add in fittings and let us turn 9mm 18×7 Stainless Steel Wire Rope into a one-off assembly. All sorts of strand and bundle configurations can be found on our stainless steel rope page. The properties of the material itself do not change, but the arrangement of the wires within each rope can significantly alter performance potential. 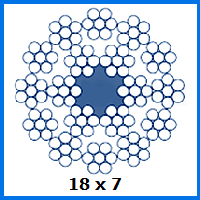 1×19 rope is simple and strong, 7×19 rope is super flexible and this 18×7 rope fulfils a different role altogether. It still provides a decent load capacity, but is most adept when it comes to abrasion-resistance. More bundles means less wear and tear, although compacted rope offers this to an even greater degree. Also worth noting is that this 9mm rope comes with a 41.7kN breaking force rating, allowing it to stay safe and strong even when under varying amounts of strain. We briefly discussed the bespoke production service that Rope Service Direct offers in the introduction. You truly can customise your stainless steel rope order with sockets, turnbuckles and other types of terminal; all you need to do is ask. Drop us an email using our enquiry form when you are ready to find out more about all our wire rope products. Call 01384 78004 and let our team guide you over the phone. 9mm 18x7 Stainless Steel Wire Rope Overall rating: 5 out of 5 based on 6 reviews.